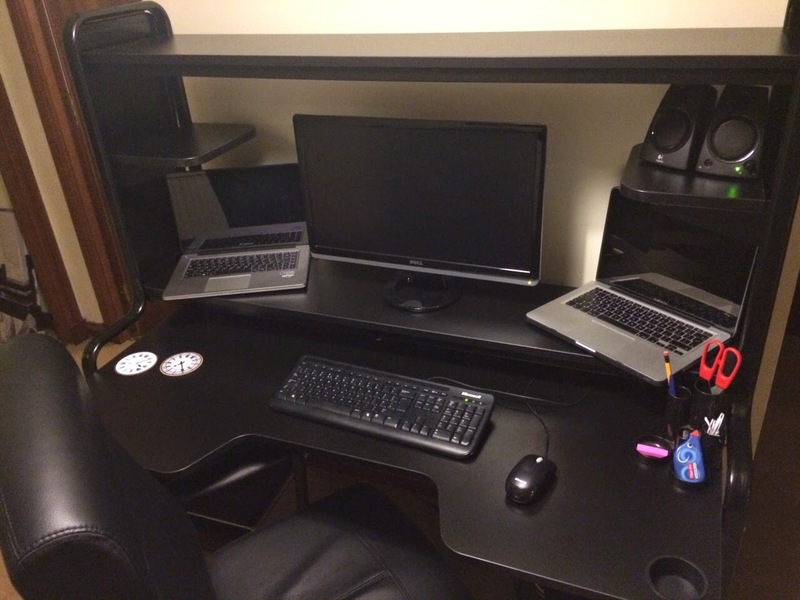 Setting up your desk for efficient working is a vital step for any software developer, whether working from their home or in an office environment. In this post I set out a few tips on how to make your environment as effective as possible. Note: This post is slightly different to my usual content, but I've been reading a book just now - Technical Blogging by Antonio Cangiano (responsible for Zen and the Art of Programming and Math-blog) - which stresses the importance of keeping up your pace of blogging when you start out. So while I've been too busy to blog as I've been building a new desk for my developer setup, I realised it formed a great subject for a blog post. I plan on writing a review post on the book (great so far) so look out in the future. Hardware requirements - some developers need one laptop, some need multiple machines, some need other devices attached such as mobile phones for app developers. As you can see in this post there is a huge development environment setup variety even in a workplace like Google. With that in mind you should focus on the three key factors above. When working with cost I recommend prioritising a good chair and desk. You will spend a lot of time (most likely multiple hours per day) so comfort is key. No matter what other equipment you buy, if you aren't comfortable you'll never sit at your desk and work. Space is the one you can't really impact. However, a good desk can help you manage your space effectively. You want a clear working area but you want everything close. When worried about space, I find using TeamViewer to remote onto other machines can be a really good space saver. In my desk environment, I like to use only one monitor as I find additional screens distracting; however, I'm usually switching between my windows desktop, a windows laptop and a Macbook Pro (I'm looking at attempting iphone app development in addition to Android now...) so using TeamViewer to control the two laptops works great for me and keeps my desk clear. The problem with hardware is that it again impacts cost and space. Cluttering up your desk can lead to loss of comfort and distractions. I suggest where possible, you use remote desktop or something like TeamViewer and store the hardware elsewhere. Remember you'll probably need multiple power sockets! Some speakers are well worth it if you like to listen to music as you work. Can you get rid of a desk phone and use services like Lync or Skype? Can you go paperless, so you don't need space for a printer. If you run your own business remember to keep receipts for all equipment (desk, mouse, keyboard, computers) so you can claim them off your tax submissions. As always additional ideas are always welcome so please leave a comment below.